It’s June, and we all know what that means – fishing will now officially dominate your summer to-do list. Or at least we hope so! Some of our weirs are starting to record the first salmon of the year returning to the rivers, which is always exciting. Have a look at our fish counts page for more information. Our stocking trucks are hitting the road daily, putting hundreds, if not thousands of nice-sized fish in a local lake or pond near you. And, we can’t forget to acknowledge that our stocking trucks are also putting salmon smolt in many saltwater terminal fisheries. We’ve done our part to grow ‘em, now it’s your turn to go out and catch ‘em. We’ve started some new Facebook and Instagram pages! Check us out and connect with us on social media. Think you know your salmon? Take our Pacific Salmon ID and Lifecycle quiz. Good luck and be sure to post your score on Facebook. Did you know that Alaska is home to two of the most technologically advanced sport fish hatcheries in the nation? Located in Fairbanks and Anchorage, our two facilities produce over 4 million fish per year for sport anglers across the state. The Division of Sport Fish puts a tremendous amount of its resources toward fisheries enhancement to reduce fishing pressure on wild stocks. Our goal is to provide more opportunities for anglers to catch and keep some fish for a family dinner. Both of our sport fish hatcheries are state-of-the-art, using technology that is far from the typical fish hatchery that you may have seen in the lower 48. To efficiently raise fish, we need our water to be warmer than what we record after it’s pumped from the ground. What that means is, we must heat our water! And, if you’re from Alaska, you know that energy costs are high, so it’s not cost effective to only use the water once, meaning we recirculate up to 95% of our water to reduce costs. In Fairbanks, the Ruth Burnett Sport Fish Hatchery, located at 1150 Wilbur St. rears five species of sport fish that are destined for area lakes. Chinook and coho salmon, Arctic char, Arctic grayling, and rainbow trout are raised from eggs, many to a catchable size before stocking. Over 400,000 fish are stocked in over 135 landlocked lakes each year, allowing Interior anglers numerous opportunities to reap the benefits from this state-of-the-art hatchery. Housed under a single roof, we can raise fish year-round, even during the harshest of Alaska winters. 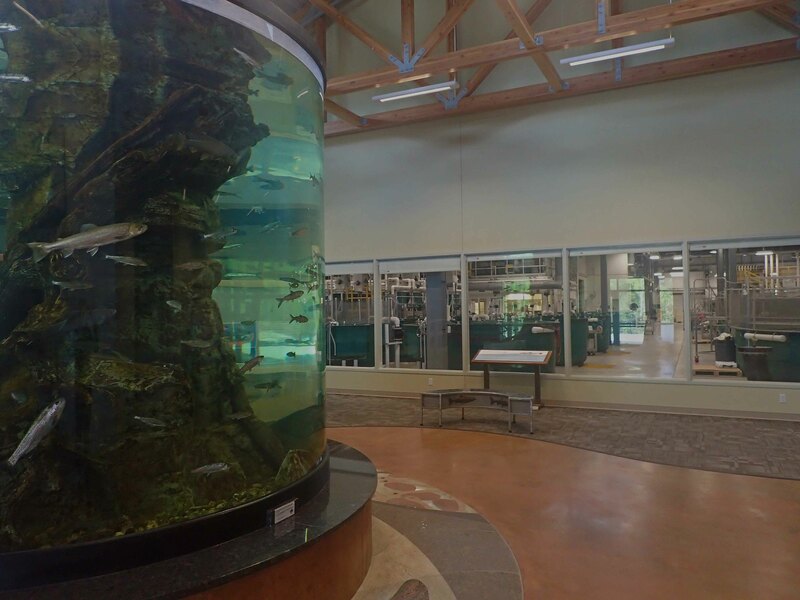 In Anchorage, the William Jack Hernandez Sport Fish Hatchery, located at 941 Reeve Blvd., near Joint Base Elmendorf – Richardson, rears the same five species of sport fish. 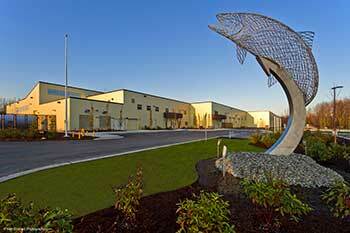 Fish from this facility are stocked throughout Southcentral Alaska in to over 150 locations. Some salmon smolts even get to ride the Alaska state ferry or barge to reach their stocking site! Both hatcheries provide opportunities to learn more about fisheries enhancement in our Fisheries Centers. Plan a visit to either the Ship Creek Fisheries Center in Anchorage, or the Tanana Valley Fisheries Center in Fairbanks. Both are free. If you toss a rockfish suffering from barotrauma back into the water, chances are it’ll float belly-up. It’s not dead, it just can’t swim back down due to gasses inside the fish’s swim bladder expanded as it was reeled to the surface. This expansion of gasses inside the fish can cause the stomach to pop out of the mouth and can force the eyes to look as if they’re about to explode. A fish floating belly-up on the surface of the water is an easy target for birds, other fish and marine mammals. 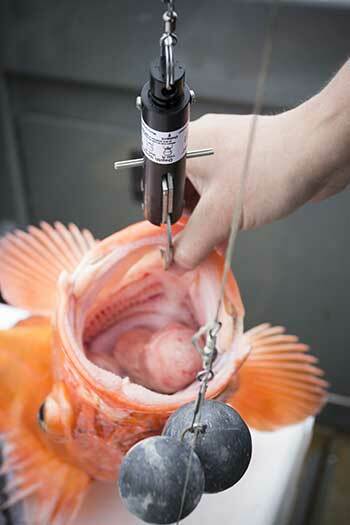 Do your part and help conserve Alaska’s rockfish populations by practicing deepwater release. Fish released at the depth they were initially hooked or 100 feet (whichever comes first) have a much greater chance of survival than fish released at the surface. Check this out! This newly released video demonstrates how to use a deepwater release mechanism. Birch Lake, at mile 306 Richardson Highway is stocked with rainbow trout, Arctic char, and king salmon. Birch Lake covers 800 acres; has two basins, two inlet streams, one outlet stream, good bottom contour, and a range of bank structure from shallow drop off on the west shore to steep drop offs on the northwest and south end of the lake. There is a large jutting point of land on the east side. Tip of the month: Use all resources at your disposal when thinking about fishing a lake you are unfamiliar with. ADF&G has bottom contour maps of many area lakes. Research the lake on the Alaska Lake Database. Talk with local tackle shop owners and find out where and what is hot. A beaver house on the bank is a good indicator of a steep drop off. Look for ‘edge’; that is try fishing where two habitats come together. For example, inlet and outlet streams; off jutting points of land; where the aquatic vegetation ends, and where a nice shelf suddenly drops off to deeper water. It’s that busy time of year - school is out, spring cleaning is in full swing, and that list of summer projects just keeps getting longer. 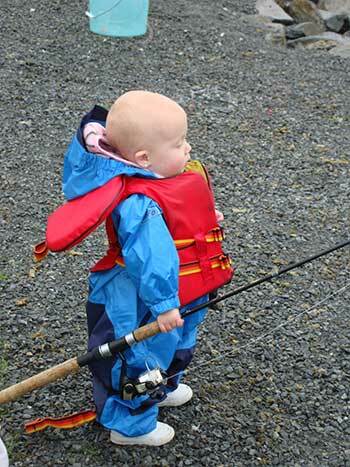 If taking your young one’s fishing is on the list– maybe we can help. From mid-May through the end of June the Alaska Department of Fish and Game partners with the USFS and numerus civic groups to host kid fishing day events throughout Southeast Alaska. A list of these events and staff contacts is provided below. Staff will be available to loan rods and fishing gear and assist – even with that enviable right of angling passage, the dreaded line tangle. Stop by and check it out even if you haven’t been fishing before – this is a perfect opportunity to get your feet wet so to speak. If the timing doesn’t fit your schedule give us a call or stop by the office—chances are that another event or fishing opportunity will. Thank you and we look forward to seeing you –wefishak. P.S. Don’t forget to bring your camera –you might take that winning photo for the front page of next year’s regulation summary. Fish on! Words every angler loves to utter. However, as an angling Mommy there is nothing more exciting than seeing the look of pure happiness and shock on my sons face and hearing him shout, “I have a fish!” when he not only hooks but reels in his own fish. 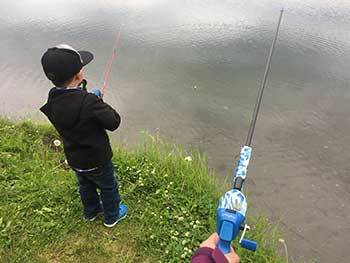 My son and I like to visit one of the many stocked lakes in the Anchorage area to decompress from work and daycare. There are over 130 stocked lakes just in Southcentral Alaska. The Alaska Department of Fish and Game (ADF&G) stock thousands of landlocked Chinook and coho salmon, rainbow trout, and Arctic Char each year. The William Jack Hernandez Sport Fish Hatchery stocking trucks having been out and about making stops around the area in the past week. Anglers can visit the ADF&G hatchery and stocking webpage for stocking updates. Over the last two years, my son has been perfecting his cast at one of the many stocked lakes in Southcentral Alaska. Like all anglers we’ve had the occasional near misses of flying tackle (mostly at Mommy’s face) and mis-hooks trying to land the big one. He has hooked and released countless catchable size Chinook salmon and rainbow trout. To him every fish is the big one. 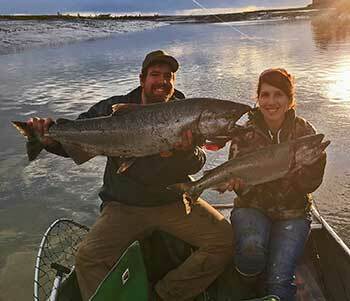 Stocked lakes throughout Southcentral Alaska offer individual anglers and angling families a perfect opportunity to get out and wet their lines while waiting for the prized Chinooks, sockeye, and coho salmon to return to the rivers and creeks throughout Alaska. But most importantly, we are creating memories together by partaking in something we both love, fishing. Because sometimes it’s not about catching the “big one” but instead about having moments with our kids and creating memories before they are too big. So dust off that fishing gear, round up the kids, grandkids, nieces, or nephews, a neighbor, or friend, find a little patience, and get outside and go fishing. The fish are calling, and I must go. Get out and fish. Together. Share your fishing stories using #wefishak. Razor Clamming – Can we dig for clams yet? 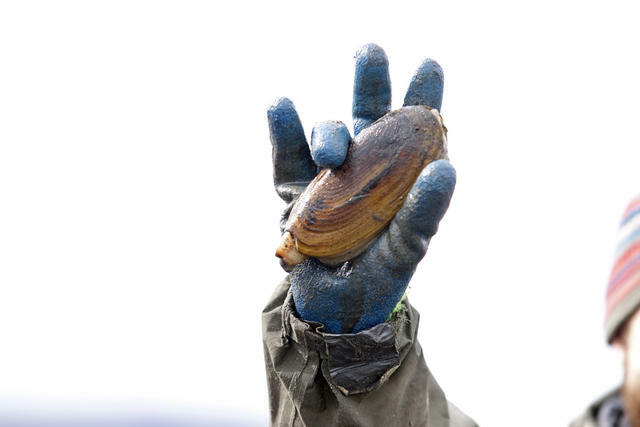 Over the last several years, clamming on the eastern shores of Cook Inlet from the Kenai River to the Homer Spit have been closed by Emergency Order to harvest. These closures have led many to ask, "What’s going on with razor clams?" The article, "Digging into Razor Clam Questions" describes in detail the many facets of eastside Cook Inlet razor clams. What’s more Alaskan than a salmon BBQ! Give this amazing recipe a try from our friends at the Alaska Seafood Marketing Institute the next time you fire up the grill.